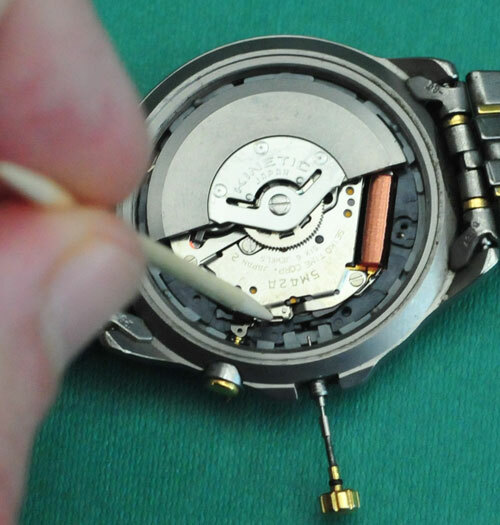 DISCLAIMER - please note that I am NOT a professional watch repairer, this page is just to show you how I did the replacement on our own 13 year old watches, which may or may not be the right way to do it, though it worked for me. I do not bear any responsibility for damage you cause to your own watch by repeating the process. 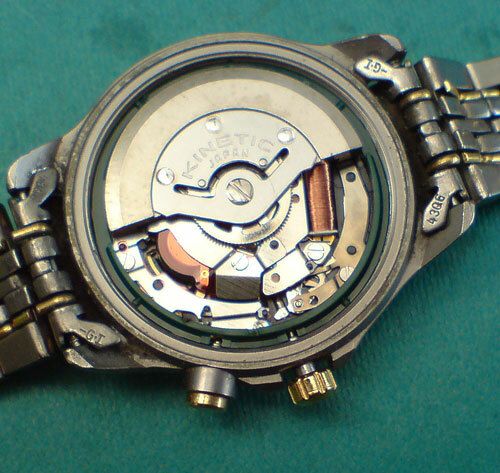 Seiko are perhaps the most innovative of all the major watch manufacturers, but sometimes they get it wrong. 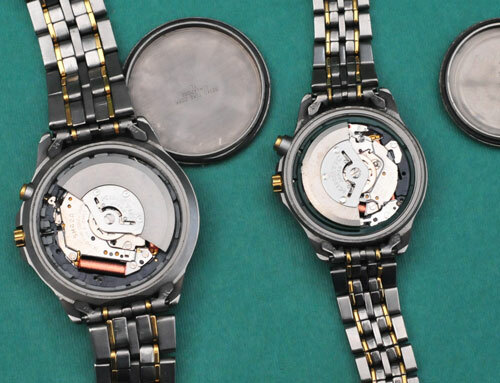 In Europe Seiko released the ‘kinetic’ range of watches in the early 1990’s. The concept is brilliant  combining the swinging weight rotor of an automatic mechanical watch with the accuracy and low maintenance of quartz, and promising freedom from the need for regular battery changes. 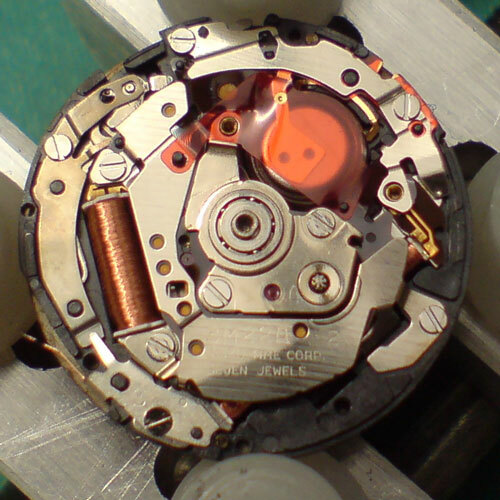 Whilst the technology now (2008) works very well indeed, the early kinetic watches suffer from serious problems with the energy storage system, based on a capacitor. 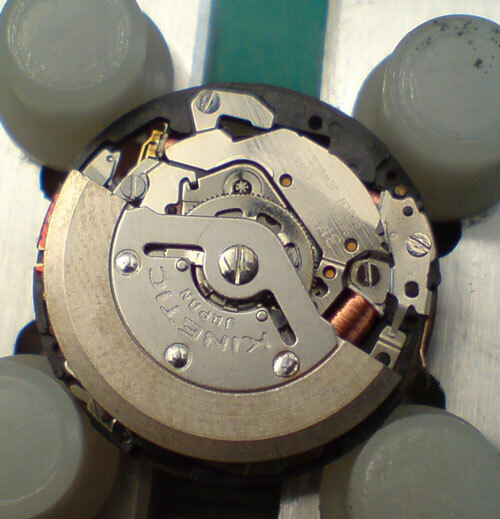 These frequently fail to hold charge after a few years of use, and so cost the owners far more to maintain than if they’d bought a battery-powered watch in the first place. 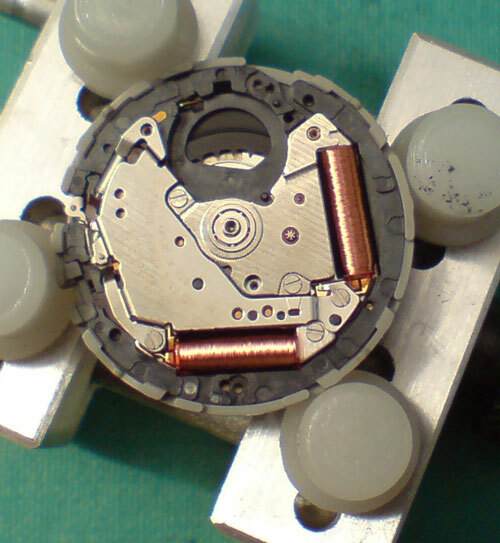 To Seiko UK's dishonour they never offered a recall to solve the problem, an attitude that must have lost them many future sales from annoyed customers, but at long last the Japanese parent company have got round to solving the problem by issuing moderately-priced service kits that replace the troublesome capacitor with a rechargeable lithium ion battery that offers up to 30 times the storage capacity of the earlier system. 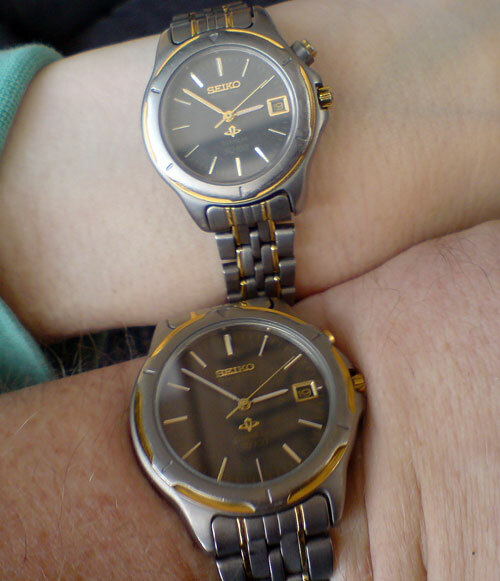 In 1995 I bought a his n’hers pair of Seiko Kinetic titanium watches, the gents watch has calibre 5M42 and the ladies has 3M22. 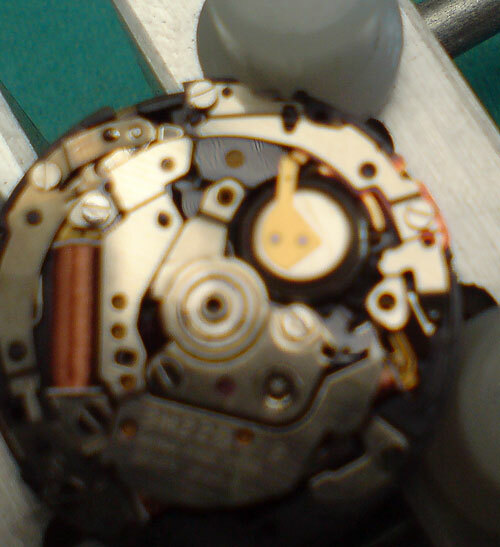 Both watches failed by 2001, were repaired with new movements, and by 2008 both needed work again. My wife's 3M22 wouldn't hold a charge overnight. 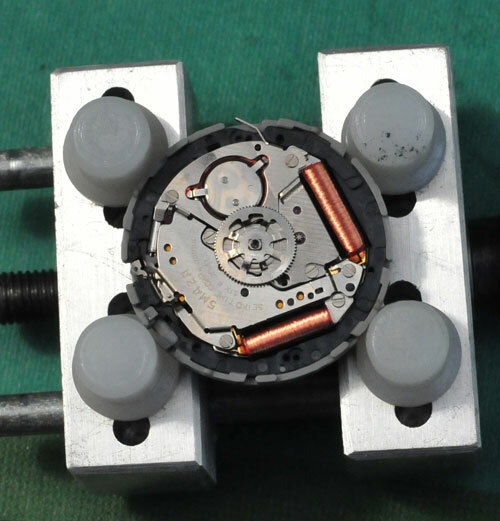 An internet search revealed the existence of the upgrade kits, and I found two helpful websites - http://www.alexanderscott.com/seiko%20repair/seiko.html where step by step instructions showed me how to dismantle a 5M42 movement and http://www.kinetic-repairs.co.uk/ where you can buy the required parts. US readers can try http://www.swatchbattery.com/seiko.html where there is also a link to a very good 3M22 tutorial (which I discovered only after I'd already worked on the watch). 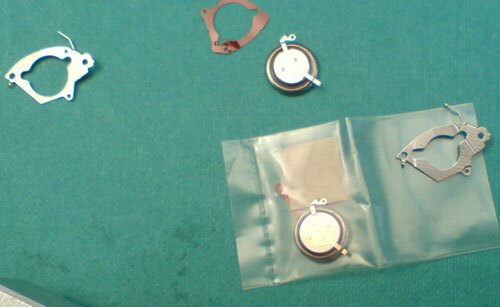 I ordered the upgrade kits, plus spare case-back O-rings, spare screw, from Kinetic Repairs. These arrived next morning, along with a movement holder and some tools from http://www.tickintimeworldofwatchtools.co.uk/ . You need a caseback opener, insulated tweezers, very thin-tipped screwdriver (I had to file mine down a bit), movement holder, and somewhere to hold the screws you remove and other pieces so that they don’t roll on to the floor never to be seen again. If your eyes aren’t good or you don’t have a steady hand it’s going to be hard to do some of the fiddly stuff. Good idea to get some finger covers (like mini-condoms) to prevent getting grease and moisture into the movement. 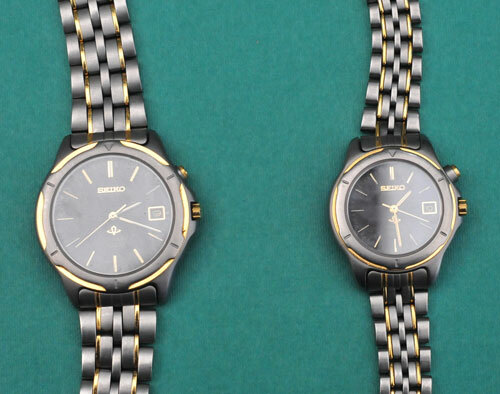 Here are the two watches. Now nearly 13 years old they still look good, with a little bit of care they’re good for some more years yet. 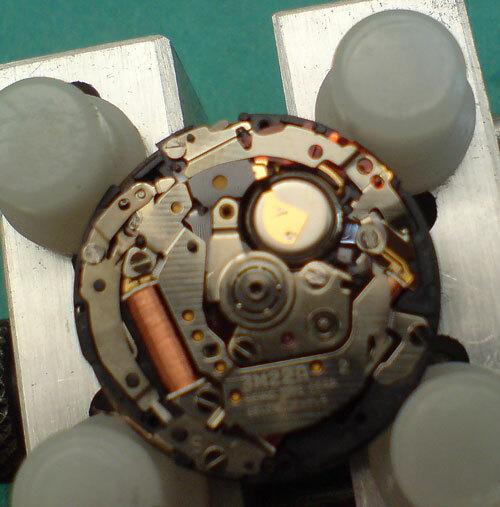 Case backs removed, exposing the 5M42 and 3M22 movements. 1. 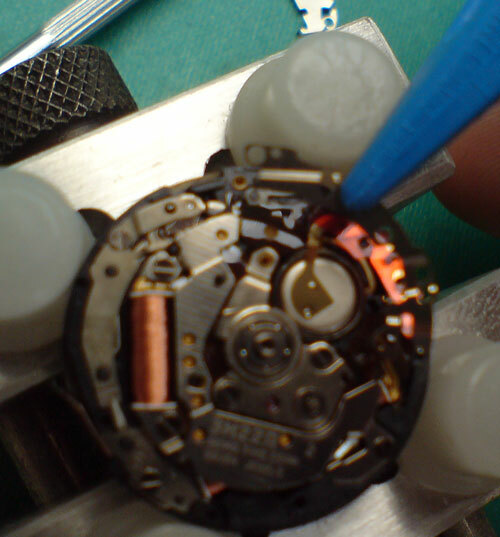 Remove caseback using suitable tool. 2. Remove stem. Pull the stem out to the first click, then (if the stem is at 6 o’clock) look for a small opening to the left. Poke around with a cocktail stick or pin and you’ll find a tiny tab that can be depressed while you pull gently on the stem  the whole thing slides out easily  put it away somewhere safe. 3. Once the stem is out the whole movement will lift out of the case. 4. Place the movement in a movement holder (otherwise you’ll likely damage the hands) face down. 5. 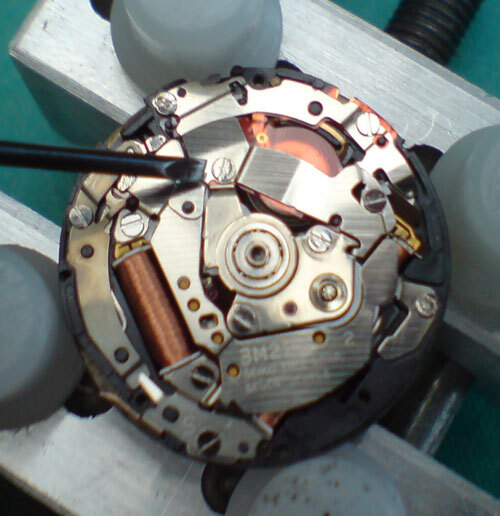 Hold the rotor weight still and remove the central screw. In both the movements I worked on this was very stiff to start with, and the screw slot is shallow so take care - I needed to use emery paper to file down the blade on my screwdriver so that it would fit properly. 6. 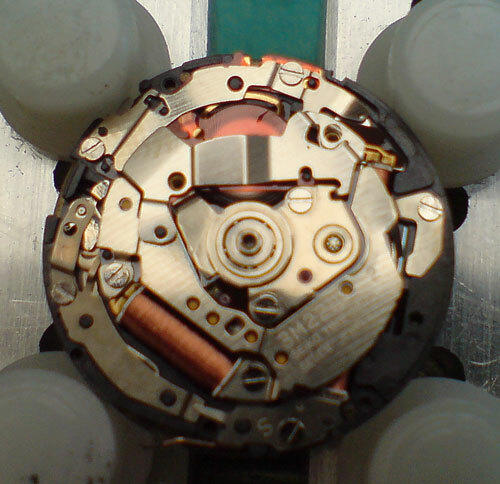 Once you remove the rotor weight, you will see that underneath it there is a cog. Remove by lifting off with tweezers. 7. You can now get at the old capacitor, remove the screws either side of it that hold the metal cover in place, and lift off the metal cover. Be careful not to lose the screws! 8. Lift off the mylar insulator  there’s a replacement in the kit  but carefully note which way round it lies, so that you can put the new one on the right way. 9. Lift out the capacitor. 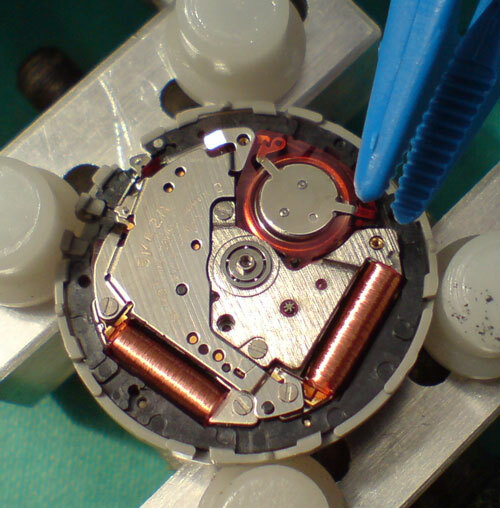 Note that the li-ion battery looks similar to the capacitor, but has a gold-coloured top plate and a different-cut out on the replacement metal cover (the one of the right) compared with the old (on the left). Hence need for replacement mylar insulator. 10. Using plastic tweezers, remove the new lithium ion battery from the pack and place in the space that used to hold the capacitor. 11. Cover it with the fresh mylar cover. 12. Replace the metal cover plate with the new cover that came in the kit, and screw back down. 13. 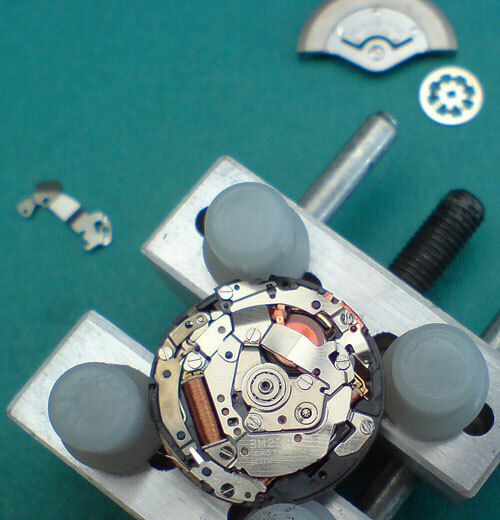 Pop the cog back on  you need to jiggle it around to fit fully in place. 14. Screw the rotor firmly back in place. 15. Insert movement back into case, having taken the opportunity to clean the case and crystal inside first. 16. Pop the stem into place until it clicks home. 17. 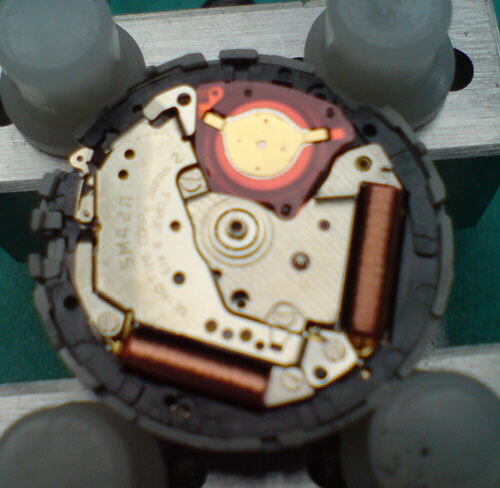 If required, replace the gasket O-ring and screw the caseback onto the watch. That’s it  should all work now. This movement is smaller than the 5M42 so some parts are smaller and more fiddly - time maybe to let your wife/girlfriend join in the fun, she's likely to have smaller fingers and women are maybe less clumsy than us blokes. 1. 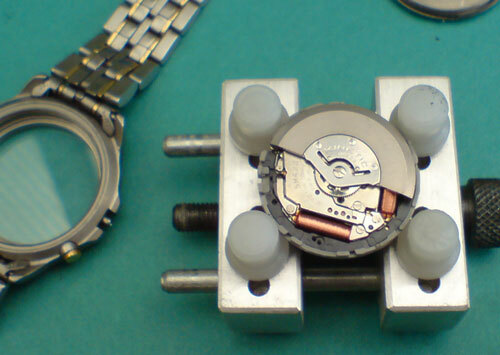 Remove caseback using suitable tool  easier if you undo the bracelet first by pushing out the pin at the clasp. 2. Remove stem. Pull the stem out to the first click. With the stem at 6 o’clock, you’ll see a small opening to the right. Press down on the metal tab you can see through the hole (I used a sewing needle) whilst pulling on the stem and it will slide out easily. 3. 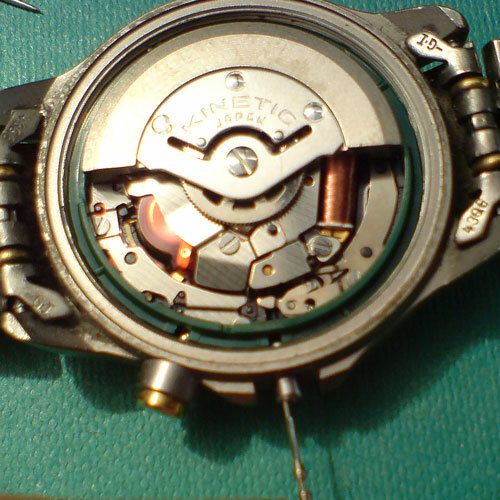 Once the stem is out remove the plastic movement holder (green coloured on this watch) and the whole movement will lift out of the case. 5. 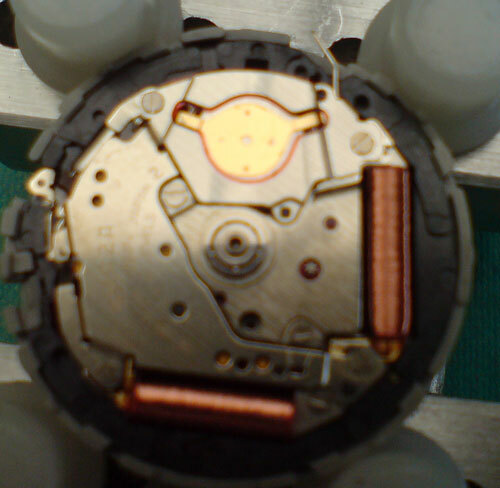 Hold the rotor weight still and remove the central screw. 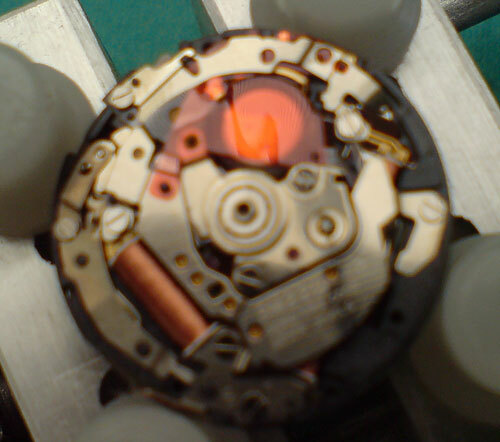 It’s quite stiff to start with, and the screw slot is shallow so take care. 6. Lift off the central cog. 7. 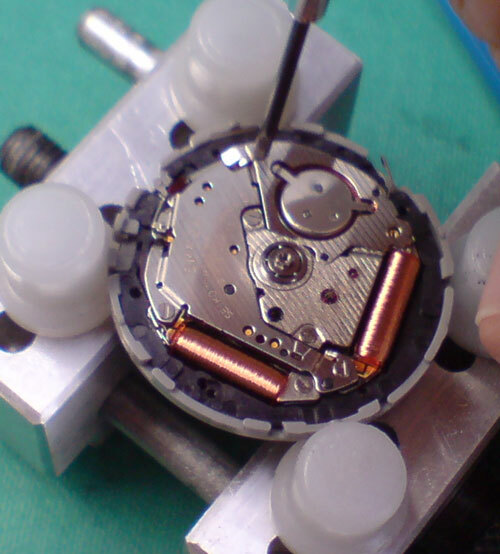 You need to remove the metal plate above the capacitor by unscrewing the two screws that hold it in place. Be careful not to lose the screws! 8. Lift off the red mylar insulator above the capacitor  there isn’t a replacement in the kit  and carefully note which way round it lies, where the holes match up with locator pins and so on - this is fiddly when putting it all back together so take a photo or sketch it. 9. 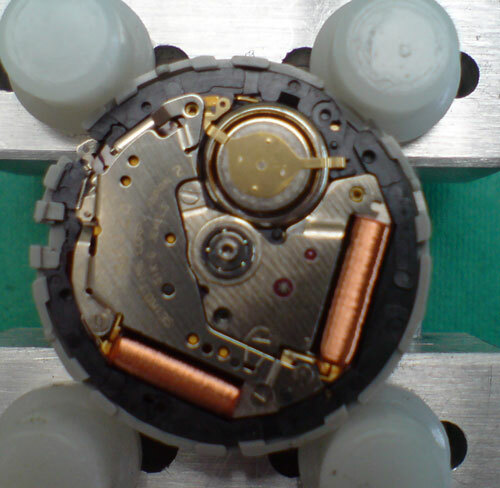 The capacitor has a gold-coloured extension attached to it that is still held by a further pair of screws that attach a second metal plate on the outside rim. 10. Remove the screws, lift off the plate, remove another mylar sheet (DON’T lose it) and you can now lift out the capacitor. 11. Using plastic tweezers, remove the new lithium ion battery from the pack and place in the space that used to hold the capacitor. 12. 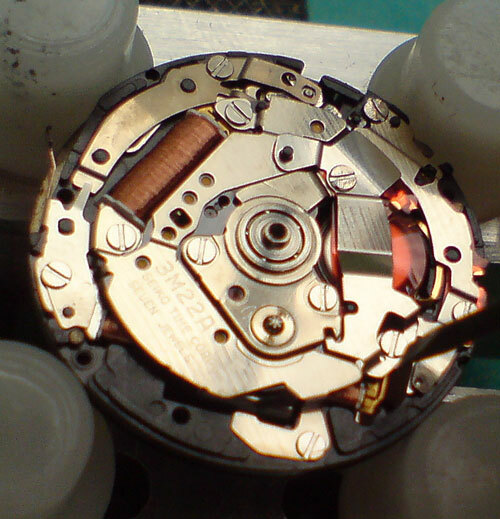 Replace the outer rim mylar insulator (over the gold tab that extends from the battery), and cover plate. 13. Cover the new battery with the larger mylar insulator and fit the replacement metal cover plate from the kit. 14. 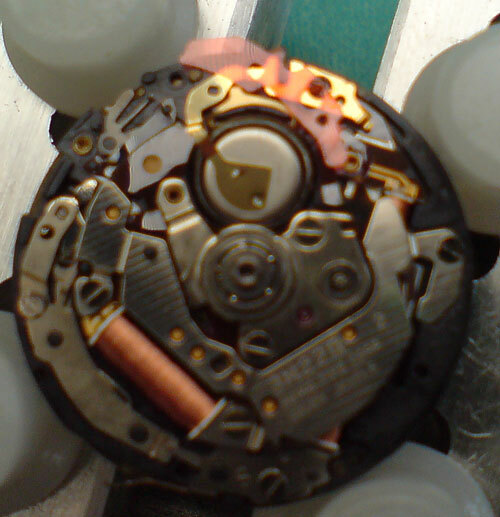 Pop the cog back on  you need to jiggle it around to fit fully in place. 15. Screw the rotor FIRMLY back in place. 16. Insert movement back into case, having taken the opportunity to clean the case and crystal inside first. 17. Replace the plastic movement holder, push it down so that it’s all in place with the cut-outs over the stem and power indicator pusher. 18. Pop the stem into place until it clicks home. 19. 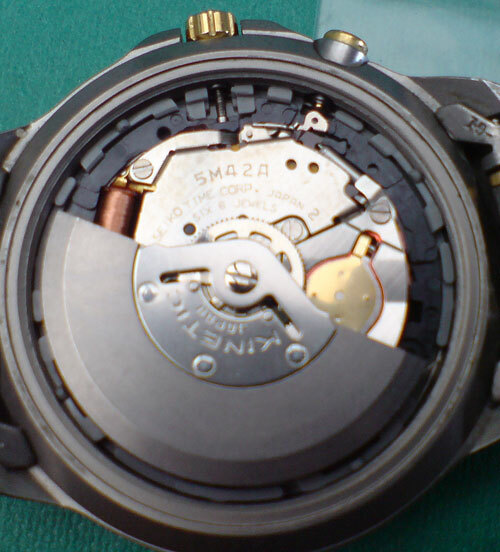 If required, replace the gasket O-ring, then screw the caseback onto the watch. 20. It should all be working now, enjoy the watch. Here are the pair of watches working nicely after the upgrade.